CG Virtual Mannequin EZR | Tanaka Printing Co., Ltd. Eye Catching! Attractive to Customers! Attention Grabbing! Virtual mannequins have outstanding impact to attract customers. They can be used for indoor events, exhibitions and at stores. It is also recommended for inbound business thanks to the foreign language announcement function. 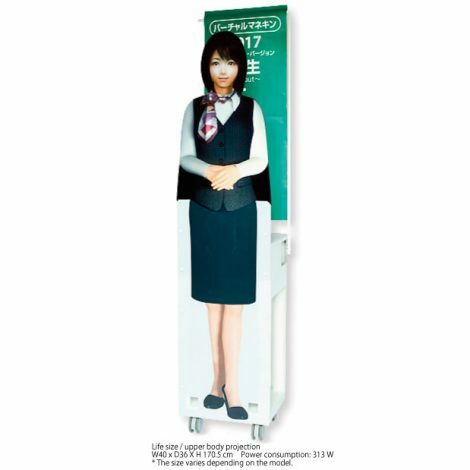 It is easy to carry and set up as the “projector” and the “humanoid projection stand” are integrated. Setting up the life-size virtual mannequin only requires a small space with a width of at least 40 cm and a depth of 36 cm.